Cambridge in the UK is sometimes held up as an example for other cities to follow. The city generally claims a cycling rate of about 25%. However, this is a rate for commuters only, including students, and not the proportion of all journeys which are made by bike. Estimates of the percentage of journeys by bike for all purposes are harder to find, and often hover around 18-20%. In a rather glowing article in the Guardian earlier this year it was claimed that "one in five" journeys are by bike. This is not bad at all for Britain. In fact, Cambridge's modal share for cyclists is almost certainly the highest in the English speaking world. That's one of the reasons why we moved to the city in 1991. We lived in Cambridge for 16 years and we wouldn't have stayed so long if it were not a pleasant place to live. However, the conditions for cycling are really only so-so. The reasons for Cambridge's relatively high cycling rate are unusual, specific to the city, and not easy to copy elsewhere. What's happened since we left ? We visited Cambridge briefly in October to visit some friends. After becoming used to the rapid progress and dramatic changes to cycling infrastructure in Assen in four years, it was interesting to see that essentially nothing much had changed for Cambridge cyclists in four years. Speed limits remain high, cycle-lanes remain narrow, cyclists are still expected to share lanes with buses and few residential roads are designed to limit rat-running. We also went along the much celebrated Gilbert Road. This looked less like somewhere which had recently received attention and more like somewhere which still desperately needed work. It still relies on narrow on-road cycle-lanes to separate cyclists from motor vehicles. Since we returned to the Netherlands, there has been another story in the local paper about the utter chaos caused by people driving their children to school and parking in the very road where we used to live. It's a long way from what the school run looks like in Assen. Cambridge still feels like a city where quite a lot of people cycle despite the conditions, and not one where the entire population is invited to cycle because of the conditions. Just behind the "cyclists dismount"
the stands intended them to be used for. Cambridge is an atypical city, with unusual demographics. Cycling is largely split along demographic lines. While Cambridge's population is around 130000, the two universities cater for about 43000 students, making up a substantial proportion of the total population. Students are a particularly easy demographic to attract to cycling. They're young adults, well educated, more confident than average and have to be fairly careful with money. Cambridge is not alone in having a higher proportion of trips by bike because it is a university city. In fact, the top cycling cities in most countries are university cities. This includes Groningen in the Netherlands, Copenhagen in Denmark, Davis and Portland in the USA as well as Cambridge in the UK. It is not possible to copy the extra proportion of trips by bike due to the large student population to other similar cities which don't have a large student population. However, Cambridge goes further than most and almost forces students to cycle. Few people from outside the city, and not all within it, realise that "Undergraduate students are not normally allowed to keep a car", or as it is put elsewhere, "it is a Regulation of the University, agreed with the City Council, that students are not allowed to keep a car or motorcycle in Cambridge". There are exceptions, for instance for physically disabled students, but most students don't drive in the city. Enough students are banned from keeping a car in Cambridge that if just half of them made all their journeys by bike, no-one else would need to cycle at all to achieve the headline cycling modal share of the city. Who else cycles in Cambridge ? Cycling in Cambridge also benefits from the fact that many students remain in the city after graduating in order to work for one of the high-tech companies in the area. Also, many people move to the city to work for these companies after graduating at other institutions. The city is home to a higher than usual proportion of graduates and many people have noted that those who form the cycling habit at University tend to continue to cycle afterwards, especially at the start of their careers when they're still young and don't yet have responsibility for children. Cambridge is a very young city due to the recent graduates as well as the students. Cambridge Cycling Campaign committee members are also predominantly from the "University and high-tech" end of local society1. Many members of the campaign are the same2. Cyclists in Cambridge are predominantly people who identify themselves as "cyclists", or at least are a member of the university and high-tech demographic that cycles. They've taken the unusual step of doing something which the majority of the British population now never does: riding a bike. This is great, but with such a source of commuting cyclists, it's surprising that it is still only a quarter of journeys to work that are made by bike. Just as it is not possible to copy the extra proportion of trips by bike due to the large student population to other similar cities without a large student population, so it is not possible to copy the extra proportion of trips by ex-students who kept the habit of cycling. Note that I am not saying that everyone who cycles in Cambridge is either a student or works in a high-tech company as of course there are some cyclists who fit into neither of those groups. However very many of those who cycle in Cambridge are part of one of those two groups. There has long been a divide between "town" and "gown" in Cambridge. This is perhaps less severe than it once was, but it is still real. Even now it still occasionally breaks out into violence. People from families which have long been in the city and who are connected with neither the university nor the high-tech businesses and who you might classify as "working class" don't cycle at a particularly higher rate than they would in any other British town. Amongst the "town" people, car usage is very much higher and riding a bike can be seen as a reflection of being poor. That people linked with the university and high tech industries are more likely than average to cycle does not have much influence on the "town" people as they don't identify with that other group. 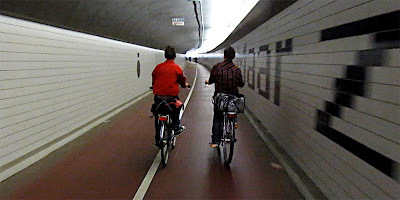 Rather, cycling has become one of the ways that the two groups, of "local people" and "students" can be identified. As I cycled in the city, drivers shouting abuse (something which happened all to often) would often refer to me as a "student" or as "poor". They were not interested in that I never studied in Cambridge and only moved there in my mid 20s to take quite well paid jobs for computer companies. To them, I was definitely "gown". I made this clear to them in part by cycling. It's not just cycling. The two sides of the town / gown divide have different priorities in other ways too. For instance, take the shops in Cambridge. The city has high retail rents. As a result, shops which sell low cost goods are relatively few and far between. Campaigns have been run by against new supermarkets opening in "gentrified" areas, even though many of the locally born people who live in the same area value the possibility of cheaper food and other bargains which the new shops may bring rather higher than having boutique stores which sell organic produce for higher prices. The divide affects attitudes of both sides. It is part of the cause of a relatively high level of intolerance experienced by cyclists in the city even though cyclists are not such a small minority as they might be in other parts of the UK. When cyclists experience trouble from drivers in Cambridge, the result tends to be quite similar to other parts of the country. They are unlikely to get much sympathy from the police or the public. I once had an experience of a Cambridge taxi driver driving into me deliberately as I rode along a counter-flow cycle-lane (very near where something similar happened to this cyclist). This driver also turned his vehicle around, chased me up the street, got out of his taxi and assaulted me. When I went to the police, the very first words spoken by the officer who interviewed me were "cyclists cause a lot of problems in Cambridge". The local newspaper in Cambridge quite often reports conflicts, with van drivers, runners, bus-drivers and youths all finding a reason to dislike cyclists. It's a huge contrast with the Netherlands where cycling is something that the whole of society finds to be normal and there is no social divide between cyclist and non-cyclist. The response is very different should anything untoward happen to a cyclist. The Cambridge Cycling Campaign was formed when shopping streets in the centre of the city, essential as part of many direct and relatively safe routes across the city, were closed to cyclists. This was a popular change amongst non-cyclists, and was possible to implement only because the public at large didn't cycle, didn't understand cycling and didn't support cycling as a means of transport. These streets have only partly been restored as cycling routes, and some of the one-way restrictions on them, which make sense only when driving, still apply to bikes. They are occasionally enforced with much publicity. These restrictions in the centre make cycling routes in Cambridge less direct and force cyclists sometimes to have to use busy and dangerous roads. The local newspaper in Cambridge often includes the same kind of articles and letters from outraged non-cyclists (red lights, one way streets, pavement cycling) which you see in other areas in Britain. These letters, and the attitudes which go with them, are unknown in the Netherlands. The conditions which cause cyclists to ignore red lights, ride the wrong way down one-way streets and ride on the pavement are to a large extent eliminated in the Netherlands by infrastructure designed to benefit cyclists, so they are not an enforcement issue. The occurrence of these problems are symptoms of a greater planning and design problem. What about the infrastructure ? I'm not the only person to have noted that cycling happens in Cambridge not because of the infrastructure but despite it. There are a few high points. The paths through the parks, though narrow, shared with pedestrians and often crowded, are relatively pleasant to ride through. Recently a good new path opened which heads North from the Northern edge of the City to some villages. Also there is a nice cycle path about 600 m long which heads to the University buildings on the West (it was chosen for the cover of the Cambridge Cycling Campaign's 2016 document). However, the better examples of infrastructure are not joined up. You can't make any journey only using these few good paths away from motorists. This is quite typical for the UK. Cyclists spend much of their time on roads which are "shared" with large numbers of cars. Also, the bans on cycling in shopping streets in the centre which originally were the catalyst for the formation of the local cycling campaign group in 1993 have only been partly repealed, leaving a useful link from the centre to the east unavailable to cyclists. Cyclists go left, pedestrians go right. Much of the separate provision that exists, is woefully inadequate, such as the short length along Carlton Way where a narrow path is shared with pedestrians for bidirectional travel. It's only a couple of hundred metres long but in this short length presents an array of problems to cyclists including a rough surface, having to give way twice, bollards, and an exciting point where pedestrians and cyclists have to cross each other's paths on a sharp corner before after another 90 degree bend cyclists are ejected into a side-road. Kings Hedges estate in Cambridge. narrow paths and bad sight lines. swimming pool, and a few shops. In the 1970s, a reasonable effort was made in the UK to create housing developments designed around people rather than around cars. The Kings Hedges estate in Cambridge is an example of this. However, these early starts have not been maintained nor developed. They also have not been linked up with other newer developments. There was also an attempt to build good cycling provision in the East of the city. However, this also doesn't really link up with anything in a useful way. Newer developments are far worse in design. No longer are there significant green spaces, no longer is there an attempt to provide a network of motor traffic free paths. limiting car parking is to make car parking more of a problem. 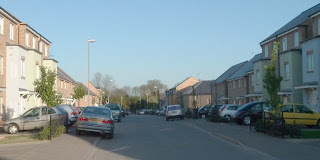 I blogged before about "The Quills", a small new estate dominated by cars, and designed with no good route to cycle to the centre of the city without riding with those cars. Also I wrote in the past about another new development, the multiply named Arbury Camp / Arbury Park / Orchard Park. The plans for this place were alarming enough, but the reality was worse. It caused many problems for cyclists before it had even been built, even if you were merely trying to pass nearby. Britain does not provide convenient and safe routes paralleling "motorways" like this, and cycling on an A-road like this is legal in the UK. You might wonder why anyone would choose to use such roads. The answer is simple. Doing so avoids a long detour along busy narrow country lanes with 60 mph ( 96 km/h ) speed limits and blind corners. Children from villages at a distance from school which would be routinely cycled in the Netherlands cannot routinely cycle to school in Cambridge. The cause of the higher than average cycling rate in Cambridge is not something that can be replicated in other British cities. Where could you convince a third of the population to agree to be banned from owning a car ? Keep cyclists away from cars absolutely as much as possible. Make all residential streets no-go areas for through traffic (preserving segregation of modes without cyclepaths). Provide bikes with more direct routes than cars. Remove cars from minor rural roads. Produce a high degree of subjective and social safety everywhere. This is what is needed to make infrastructure a draw for cycling rather than a hindrance. We had three different houses in and around Cambridge, and it's notable that in none of them were any of our neighbours particularly enthusiastic cyclists. In fact, most of our neighbours never rode a bike in the entire time we lived in those houses. This is in sharp contrast with where we live now in Assen. All of our current neighbours cycle for at least some of their journeys. Due to cycling having been made the preserve of the many instead of a hobby activity for a few, there are few "non-cyclists" and no anti-cycling sentiment. Assen is in most respects is quite normal by Dutch standards. Car parking here is the cheapest in the country, and no attempt has been made to limit the ownership of cars. New build homes here have adequate car parking as well as compulsory cycle parking. There is also no university in this city to boost cycling numbers. These things could be seen as disadvantages where encouraging cycling are concerned, but the cycling rate here is more than double that of Cambridge. More importantly, the people who cycle here come from the whole spectrum of society and are not taken predominantly from a particular demographic. Many people who view this think little more than to note that there are quite a few cyclists. Let's look deeper into it. The most dense cycle usage in Cambridge is in a few streets in the centre like this one, on routes used by many students. The conditions for cycling in this location are neither especially pleasant nor especially safe. The bulk of the cyclists that you see in the video are students. They ride for the reasons that students everywhere ride, but there are more of them in Cambridge in large part because they are not allowed to keep a car. Several unfortunate things have happened recently. The local government scrapped the much needed post of cycling officer and also while Cambridge was briefly in receipt of extra funds as a Cycling City, this initiative has also been scrapped. Investment in cycling in Cambridge has never been adequate. It's important not to lose focus and not to be complacent. Cambridge's leading position in the UK, and in the English speaking world, is the result of unusual and fortunate circumstance, not of cyclists being particularly well provided for. With investment in decent cycling infrastructure, the city has the potential to do much better. For this reason, I was recently surprised to see a proposal to rename the main campaign group in the city with a more passive tone. Your work is not finished yet. People elsewhere who look to Cambridge are looking in the wrong direction. The things that make cycling popular in Cambridge are not easily duplicated elsewhere. Instead of looking to one town which is exceptional for reasons that cannot be duplicated you would be better off looking to the Netherlands where a far higher cycling rate has been achieved even in towns with none of these special circumstances. The difference is the infrastructure above all else. A recently published research project by Anna Goodman into socio-economic patterns and their relevance to commuting in the UK supports my argument above. The chart on the right. Anna's research confirms that there is a correlation between cycling in Cambridge and affluence - precisely the point that I make above re "town vs. gown". 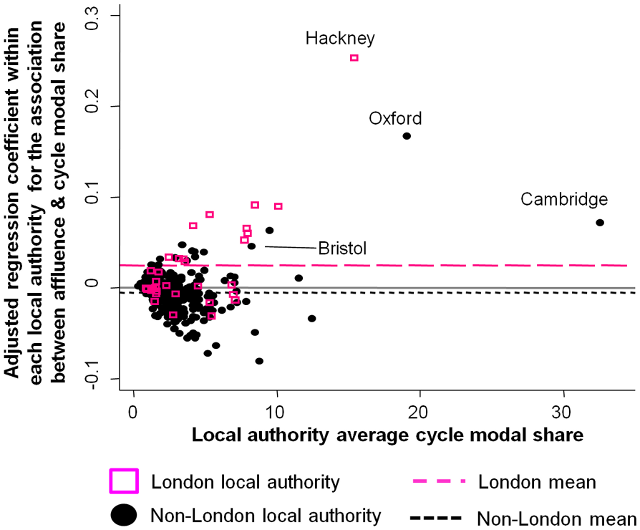 Note that Oxford and Hackney have similar demographic bubbles in which cycling is correlated with the lifestyle of a self selected and relatively prosperous section of the population. I used to visit Hackney quite often just over twenty years ago. I met my (then) future wife, Judy, in Hackney as she lived there for a time. Hackney was then a very different place demographically to how it is now. We have to recognize the effect of social change on peoples' chosen modes of transport. Hackney has been through a period of gentrification. The population is now more similar to Cambridge and Oxford than it used to be and that's the primary reason why cycling has grown in that area. The infrastructure is still dreadful and Hackney still achieves nothing like its potential for cycling. Read other posts about Cambridge. This cyclist decided he'd had enough of the road at this point. Pleasant conditions for cycling by the station ? A very narrow cycle-lane leading into to a bus stop. Those who can turn left here, mounting the kerb and riding through a park. Making short connections by riding on the pavement is an understandable reaction to the conditions. I was only here for a few minutes. Quite a lot of people prefer the pavement here. I took the photo at the top in 1998 as I cycled to work in Cambridge in the fog. Jesus Green is one of the nicer bits of Cambridge for cycling, but those shared use paths were always too narrow and too bumpy, and access to them is not what it could be. The University of Cambridge continues to be charged with elitism. They have problems with admitting people from less advantaged backgrounds, even though they've supposedly been trying for years. This is noticed even by newspapers which show the same elitism. 1 This is not in any way a criticism of the campaign committee. These are wonderful people giving freely of their time to try to encourage cycling. Cambridge Cycling Campaign is very well organised and the people in it try to do a good job. I was once a member of the committee myself. However, like everyone else their ideas are inevitably shaped by their position in society. 2 Cycle campaigners around the world often point out that cyclists are on average better educated than non-cyclists or that they have on average higher incomes. This is all very well, but it also reinforces the difference between "town" and "gown". Readers from elsewhere may be amused to hear that back in the 1990s, the local council in Cambridge produced literature which said that Cambridge was second only to Amsterdam. This was of course a smokescreen. Portland now makes the same claim. It's still a smokescreen. Indeed, Portland is boasting even more. They only have about 5% of commutes by bike which isn't close even to Cambridge, let alone average Dutch cities. We have to always be wary of nonsense like this. There is a lot of exaggeration about and it's not helpful. We tried head to head Ice-bat racing here in Assen on Wednesday morning. Great fun. What's important to keep in mind is that these things are not to slow down cyclists. Policy requires that cyclists' journeys are made more direct and faster. These are intended to slow mopeds, not bikes, and you find speed-bumps like this on main cycle routes where mopeds are also allowed. These speed bumps are larger than might be obvious from photos (especially photos with no cyclists in them). I measured this one at 10 m long by 3.75 m (32' x 12 '). 3.75 m is of course also the width of this cycle-path. Note that pedestrians have their own separate path. The distance between the humps or dips determines the speed at which you can ride over these. At normal cycling speeds, you barely notice that you've ridden over a speed-bump like this. If you cycle faster, then you do need to be aware of them. I've found that 35 km/h is on the edge of being uncomfortable over this speed-bump. That's quite typical. I guess at that sort of speed the speed-bump ought to warn me as well as the mopeds about the upcoming road junction (behind the camera). Note also the lighting to preserve social safety at night-time. The upcoming tunnel, which gives cyclists a short-cut under the railway line, is always lit. It is quite often the case that people from outside the Netherlands, not to mention those born and bred here, greatly overestimate the danger posed by bromfietsen and snorfietsen - the small mopeds / scooters which are allowed on some cycle-paths. There are two classes of mopeds. The slow ones can travel at up to 25 km/h, the same speed as an electrically assisted bicycle, and don't require the rider to wear a helmet. These are allowed on the cycle-paths in just the same way as are electric assisted bicycles. The faster mopeds are limited to 45 km/h and require the rider to wear a helmet. These are not allowed on urban cycle-paths but are allowed on some rural cycle-paths, where they occasionally provide entertainment for faster cyclists. It's also worth reflecting on how few mopeds there are. Due to being noisy and smelly and attracting attention as well as criticism, people often greatly overestimate the number of mopeds in the Netherlands. Actually their numbers are much smaller than people think. 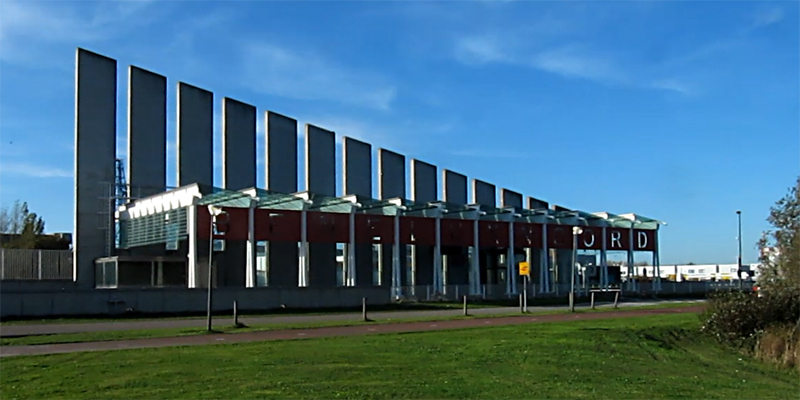 At the main railway station in Groningen which currently has parking for more than 11000 bicycles, there is space provided for only about 10 mopeds. In the most remote suburb of Assen, where for every 100 people there are 116 bicycle trips per day, just 3 trips per day are made by moped. Mopeds are about as common as bicycles are in the UK or USA. They are exposed to much the same bias against them, including claims that they are dangerous, as are bicycles in the UK or USA. Mopeds are largely ridden by elderly people who generally ride responsibly. In general mopeds are not considered to be particularly aspirational and they're not really very fashionable. This is reflected in their relatively low numbers. You'll rarely see mopeds parked outside a school which caters for higher educational standards so there's a degree of snobbery about who might be seen on a moped. In some areas they're ridden more often by immigrants so we also can't rule out a degree of casual racism. Mopeds ridden by teenagers are, perhaps unsurprisingly, not always ridden responsibly. Teenagers also quite often make simple alterations to the machines which remove the speed restrictions (similar models are sold in other countries without the speed restriction devices fitted here). This is quite a good way to get pulled up by the police and the machines can be confiscated as a result. In the Netherlands, moped riders are an out-group just as cyclists are elsewhere and they are subject to similar prejudice. How lethal are they ? How lethal are these mopeds ? Almost certainly less so than you think. I've not been able to find any data to support the hypothesis that injuries due to badly ridden mopeds are a really major health issue in this country. As Toby Sterling put it, "scooter deaths (amazingly!) were a rounding error." as well as pointing out that you are "more than twice as likely to be murdered in Amsterdam than killed while riding your bike." and that as the US murder rate is four times that of the Netherlands you are "certainly more likely to be murdered while living in the United States than to die while biking in Amsterdam." Note that Amsterdam is not all of the Netherlands. It's the largest city and quite busy and in fact it's probably one of the most dangerous parts of the country with regard to mopeds as well as other dangers. Most of the country, including Assen where we live, has a far smaller "problem" due to mopeds. To summarise, mopeds are one of the things that people get upset about in the Netherlands. But you have to put this in context. This country is very safe and there is very little to get upset about. A bit of perspective is required. What is complained about here are things that would not be complained about elsewhere. In fact, I'd go further than that: the Dutch quite often complain about things which in other nations might be a reason for boasting. You're not actually at any great danger from mopeds even though they are a nuisance and they are disliked by so many people. Nevertheless, mopeds need some control because this has become a subjective safety issue and I'd not suggest that other nations follow the Dutch example of allowing mopeds of any class onto cycle facilities because of that subjective safety issue. In order to gather good statistics on cycling rates, there are many cycle counters in the Netherlands. All around the country, small grey boxes are chained to lamp-posts, a rubber lead from them stretching across the adjacent cycle path. The boxes count cyclists who pass over the lead. They're left in place for a year, and the cycle count for the route is given as the number of times that the box has counted a bike, divided by 365. The counts produced are a true average over the whole year, not the result of counting on a sunny day in September just after the students have returned. Any automated count like this has a margin of error. The boxes will always miss some cyclists. For instance, when cyclists pass side by side (even four abreast isn't all that uncommon with school-children), only one will be counted. When there is ice or snow, or perhaps due to leaves in Autumn, the box will also miss some bikes. However, the raw data is used because by consistently counting in the same way, figures are collected which can be compared from year to year. This is not a marketing exercise. There are no signs on the streets telling people how many have been counted. This video has explanatory captions which are visible only if you view it on a computer. You won't get to see the point of the video on a mobile device. 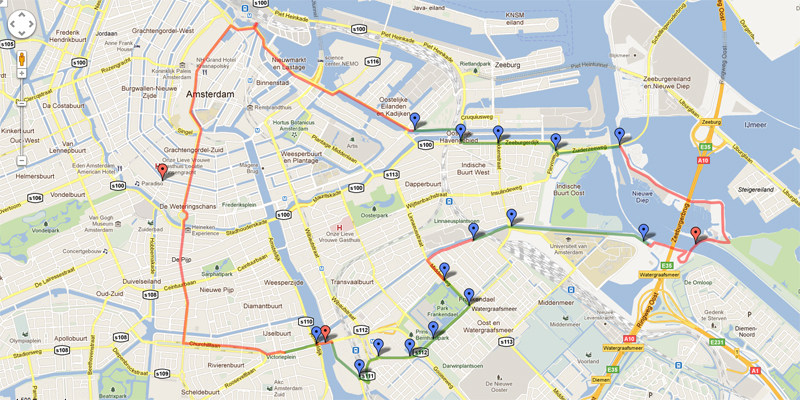 The route shown in the photo and video is Zonnelaan in Groningen, where on average over 14000 cyclists pass each day. The busiest street which is currently counted in Groningen is Antonius Deusinglaan with over 19000 cyclists per day. These are large numbers for a city of just 190000. Due to the high level of cycling all the way across the Netherlands, even small cities manage impressive counts. For instance, even though Assen's population is just 67000, an average of almost 9000 cycles per day pass through Nieuwe Huizen. Very high counts are often the result of a funneling effect where cyclists are forced to all go along the same route because of a lack of alternatives. 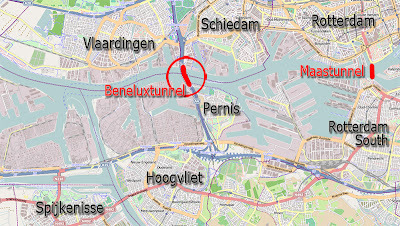 Due to the cycle network in the Netherlands being designed as a very dense grid of high quality facilities it is usually possible to find a direct route which is not overly busy as a result of funneling. Zonnelaan also features in a later blog post showing how the local government has worked to reduce the number of people taking this route by making a faster parallel route known to students who made up much of the cycle traffic along this road. Updated with a video of the celebrations! 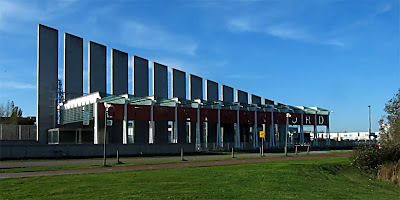 's-Hertogenbosch (a.k.a. 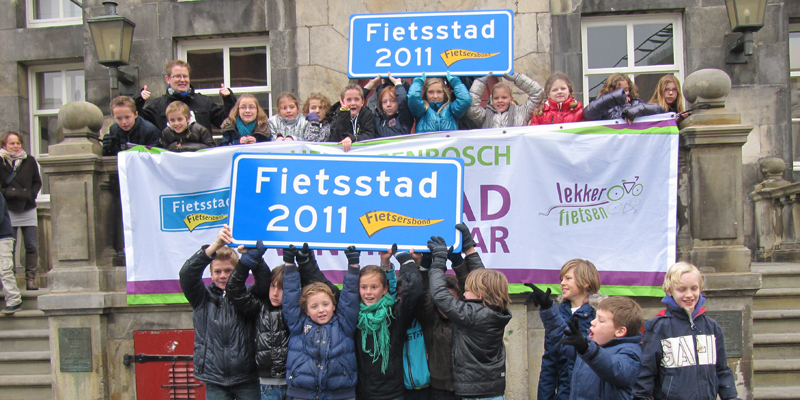 Den Bosch) won the honour title 'Fietsstad 2011' or 'Cycling City 2011' in the election organised by the Dutch Cyclists' Union. The expert jury was unanimous in its decision. Last August, the city had been selected as one of five nominees, which were in turn selected from a long list of 19 cities that had entered the competition. 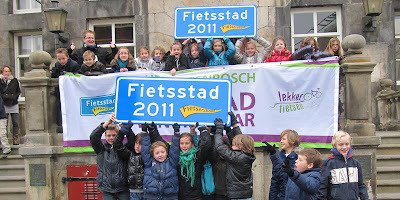 signs with the title "Cycling City 2011"
The director of the Fietsersbond (Cyclists' Union) states the following: "In recent years 's-Hertogenbosch has given cycling an enormous boost in a short time with a lot of energy, ambition, creativity and money. That is very good for a city in the South of the Netherlands where cycling levels on average are lower than in the rest of the Netherlands." The Jury was also very positive about how cycling facilities were integrated in the historical centre of the city. The award ceremony took place at City Hall in ’s-Hertogenbosch. In their speeches the jury and the director praised the city for their efforts to stimulate cycling. From the results in the short time it was obvious to them that this was a deliberate decision by the local government. The jury found it especially good that the city listens to the wishes of the citizens, even children could give their input about the cycling facilities around their schools. 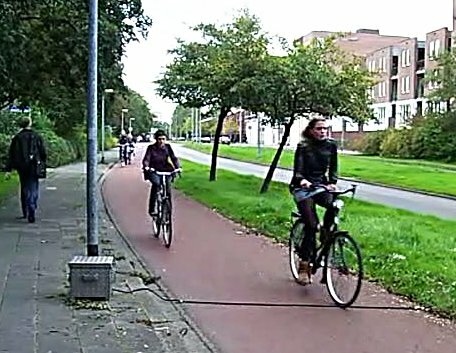 In stead of trying to change behaviour of cyclists by educating and training them, Den Bosch decided to facilitate what cyclists apparently want: if they all ride agaist traffic it proves better to make the cycle path wide enough for two way traffic, rather than to try and stop them from doing it. From a mediocre cycling city Den Bosch has now become a rising star that shot up to the top of the list. For subtitles in English click CC. It was a fortunate coincidence that a delegation of Velo-city was also present. 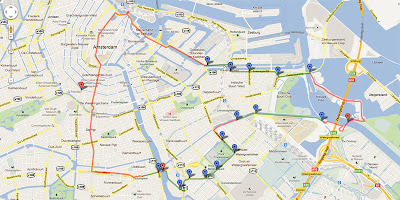 Today of all days they visited the city to investigate the candidacy of 's-Hertogenbosch to organise Velo-city 2013 (bidbook in English). I have informed you about the recent very positive developments in the cycling infrastructure and climate of the city on several occasions. Tomorrow, the 12th of November 2011, is the day of the tour of the ten most dangerous junctions in London led by Charlie Holland. I can't be in London for that tour, but urge people who are there to take an interest. London has a rising cycle casualty rate and Londoners find the experience of cycling to be increasingly scary (this is the subjective safety problem about which I've often written). The Mayor of London, Boris Johnson, responded to recent calls for improved safety at the most dangerous junction in London, Elephant and Castle (89 cyclist injuries in two years) by suggesting that conditions are fine "if you keep your wits about you". This is a classic example of the fallacy which I call "I cycle, so you could cycle too". It's not a reasonable response. It's not applicable to the majority of the population. It seems that there is still a struggle ahead in London. The city seems unwilling to change its direction without a fight. While they say they are "working flat out to deliver" better safety for cyclists in the city, it's really more of the same as has been promised for the last thirty years. The "action" that is planned is on a list predominantly of statements involving "awareness", "guidance", "training", "calling for more more to be delivered". What is really needed are fixes to the truly dreadful infrastructure of the city. This means more than adding a few advanced stop lines (a type of infrastructure so outdated that we don't have any left in Assen) and mirrors. It's not difficult to see why some people believe it's time to get angry. 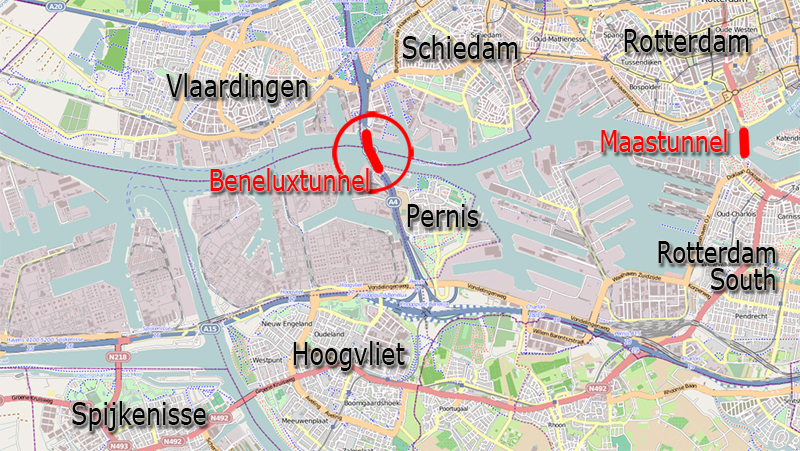 By way of comparison, what is the most dangerous junction in the Netherlands ? I recently discovered that the most dangerous junction in the whole of the Netherlands is in Groningen. There have been 14 incidents causing injury at this junction in the last three years. Those are figures not just for cyclists, but for all modes. Note that this is the worst junction in the whole country, and also that these are numbers for a period of three years. By comparison, Elephant and Castle's 89 injuries have been over two years, and these are just the injuries to cyclists. We don't know how many people were injured using other modes of transport. There is a huge difference between these two. 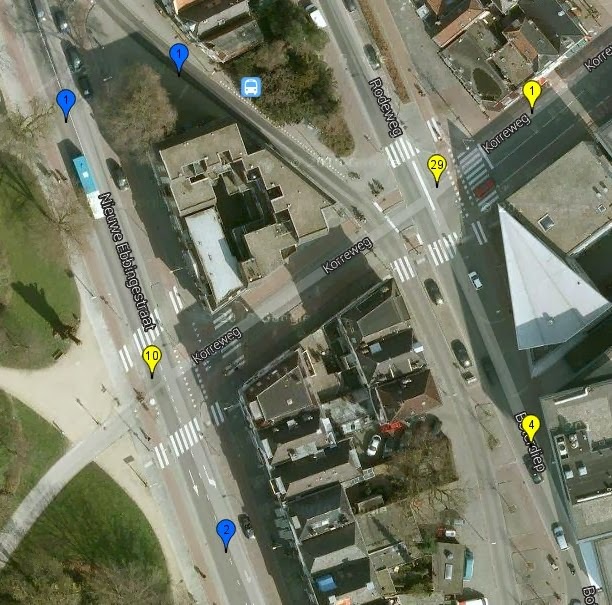 And what does the most dangerous junction in the Netherlands look like ? The explanatory captions which explain the problems with this junction are only visible if you play the video on a computer and not on a mobile device. You can also take a look around the junction yourself by using Google Maps. How does this compare with the Streetview of Elephant and Castle ? This junction has quite comprehensive cycle-paths and lanes in all directions, and motor traffic proceeds mostly at very moderate speeds. Compared with many other countries, this might initially not look bad at all. It certainly doesn't look anything like so daunting as Elephant and Castle. Actually, nowhere that cyclists go in the Netherlands ever looks remotely like this huge junction at Elephant and Castle, or any of the other 9 junctions on today's ride in London. Such junctions, where they existed, have all been redesigned some years ago. London could have done this too by now, had they started taking notice thirty years ago. 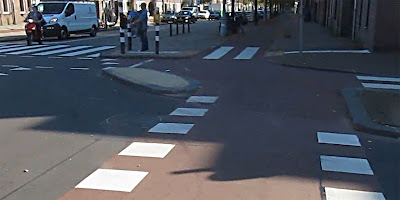 I can imagine that some readers from outside the Netherlands will be surprised that this is the most dangerous junction. While it doesn't look as good as many of the other junction designs on this blog, it doesn't really look all that bad either. Perhaps in other countries it might be seen as a success story. And actually, in one sense this is a success story. The most dangerous road junction in the Netherlands is responsible for just 14 injury incidents for all modes of transport in three years. This junction design doesn't meet current standards. It is not designed with sustainable safety principles in mind: it doesn't explain itself well, but confuses people using it, so they make mistakes. While priorities are clearly marked on the road surface, the stop line for cyclists crossing this junction is too far back, making it difficult to accelerate across the road between motor vehicles going along the other road. This is why cyclists stop ahead of where they should, in the middle of nowhere. There is a temptation for all modes to try to push through when the way isn't entirely clear, and everyone has to look in several directions at once to see what everyone else is doing. These are the types of reasons why this particular junction has the unfortunate position of being the most dangerous in the whole of the Netherlands. This junction has remained as it is for a surprising amount of time, but now it is obviously outdated. The Dutch press covered this story and made demands for this and other similar junctions to be changed. Current plans are for reconstruction in the near future as part of works when a new tram system is installed. Total traffic victims in the province of Groningen 1995-2008, all modes of travel. Yellow = injuries requiring hospitalisation, Red = deaths. I couldn't find figures for deaths and injuries for the city of Groningen, but I could find them for the whole province, of which the city is a part. While 190000 people live in the city, 574000 live in the province. As you'll see, the trend for all injuries is downwards, as is that for deaths, though 2008 sadly had a higher death rate than the three previous years. A target was set ten years ago to reduce injuries and deaths to 425 and 35 per year by 2010. This target was met before schedule. Another target has been set to reduce the figures to 300 injuries and 25 deaths per year by 2020. These figures are also for all modes of travel. Read more about Road safety in the Netherlands. We invited Boris Johnson in 2013 as well. He didn't reply. Watch a video which shows Elephant and Castle being built. Cyclists were far from the thoughts of the designers of this junction. Read more in-depth analysis of this junction in Groningen and other dangerous junction in the Netherlands. Not everything in the Netherlands should serve as inspiration. When considering cycling injuries and deaths in Groningen vs. London, bear in mind that while Groningen's population is only about 190000 while London's is 8 million. However, Groningers cycle a lot more than Londoners. They make over 250000 cycle journeys each day. By comparison, 8 million Londoners make approximately 500000 cycle journeys per day. Do you want to see this for yourself ? Book a study tour. 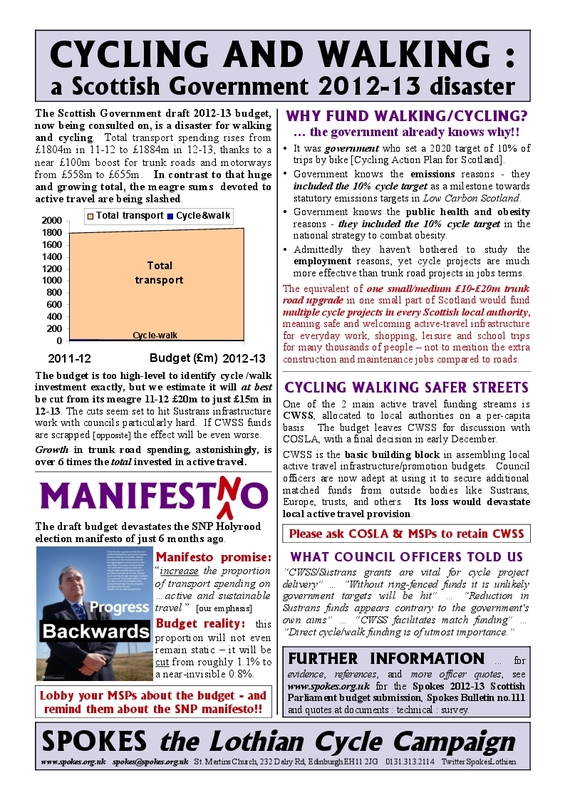 Spokes, the Lothian Cycle Campaign, has produced a handout about the upcoming transport budget cuts in Scotland. Oh, hang on. Did I say cuts ? It's only a cut for walking and cycling. The total budget for transport is being increased from £1804m to £1884m, while the part of that budget which is for walking and cycling combined is being reduced from £20m to £15m. There are 5.2 million people in Scotland, so the budget for cycling and walking combined is being reduced from £3.84 per person per year to £2.88. In other words, the budget is being reduced from 1% of the transport budget to 0.7% of the transport budget. That's not investing in cycling, it's fobbing off cyclists. Scottish politicians who promised to "increase the proportion of transport spending on ... active and sustainable travel" would seem to have gone back on their word. Another broken promise. You can read more on the handout itself (click and it gets bigger) or on the Spokes website. It's a long way from the level of expenditure which is required for growth to a significant rate of cycling. The Dutch spend about €30 per person per year on cycling. However, some local authorities in Scotland remain bullish: In Dumfries and Galloway, where the cycling modal share is approximately 3%, the new local transport strategy says "Overall, cycling and walking infrastructure is considered to be of a good standard and the council consequently considers that only incremental improvements to existing networks will be required in the short term". Clearly they're not aiming very high. If the infrastructure was truly good, the modal share would be higher. There is pent up demand in Scotland just as anywhere else, but people don't cycle as much as they'd like to due to a lack of subjective safety. The Cycling Action Plan for Scotland says that 2% of children in Scotland currently cycle to school. Cycling Scotland say it's 1% of primary school children and 2% of secondary school children. Like many organisations which despite lots of hard work still don't manage to increase the school cycling rate significantly, they are both placing more emphasis on training than on infrastructure improvements. That's why you don't see scenes like this every single day around every Scottish school. £2.88 per person per year isn't enough to change the infrastructure so that cycling becomes something that people want to do. It can't be achieved on a shoe-string, and it certainly can't be achieved when budgets shrink rather than grow. When the transport budget in Scotland is growing, what can possibly be the excuse for shrinking the budget for cycling and walking ? In Dumfries, the BBC reports that "Plans to extend a sustainable travel project have been put on hold until firm evidence is produced to prove its effectiveness". Less than two years ago, as you can read above, I pointed out that their boasting of already having "a good standard" of cycling infrastructure was premature. Considerably more investment is required to produce conditions in which people feel safe to cycle. Building just a few scattered and half-hearted pieces of infrastructure has never worked. A comprehensive network with very high quality is required. Dumfries and Galloway could have sent representatives on one of our Study Tours two years ago in order to find out what was required, but they didn't. We would still like to welcome people from Dumfries and Galloway in the future. There is much to learn. Assen is town not much larger than Dumfries and we experience far harsher winters winters than does Dumfries but people cycle here in numbers which are unknown anywhere in the British isles. Come and see how this was achieved.